Board certified by the American Board of Plastic Surgery, a member of the American Society of Plastic Surgery and American Society for Aesthetic Plastic Surgery. Dr. William Stefani, a native of Michigan was educated at Albion College. He decided on a career in plastic surgery with guidance from his father, also a plastic surgeon. He received his medical degree from Wayne State University School of Medicine and general surgical training at St. John Hospital & Medical Center in Detroit. He went on to a plastic surgery residency at Providence Hospital in Southfield. To take his skills to the top level he moved to New York. There he entered into a fellowship in aesthetic surgery at the prestigious Manhattan Eye, Ear and Throat Hospital performing surgical procedures with world renowned surgeons. 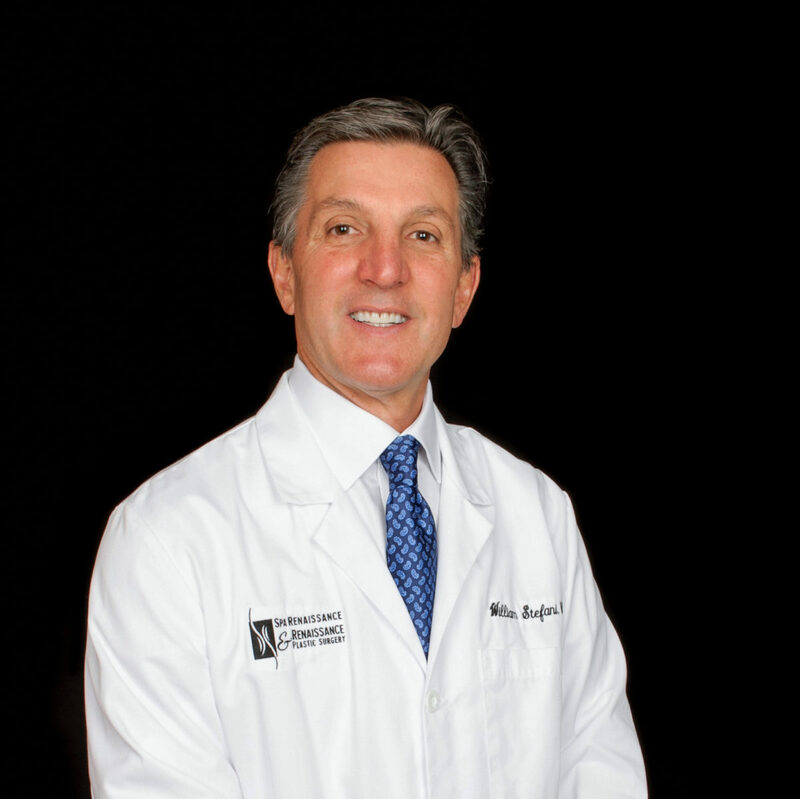 Over the years Dr. William Stefani has been voted “Top Doc” several times by Hour Detroit Magazine, Consumer Guide (a national publication), and Castle Connelly as one of the top surgeons performing aesthetic and reconstructive surgery today. He is also a member of the American Medical Society, Michigan State Medical Society and holds privileges in Michigan’s top ranked hospitals. In my opinion, Dr. Stefani is over-the-top with caring about his patients! Both my daughter and myself, along with seven other friends, have had services by Dr. Stefani and his staff. His expertise and talent again, is unmatchable! He, his staff and his practice will be the only place I ever go for anything of this nature. Thank you Renaissance Plastic Surgery and Renaissance Spa. I had a breast lift done by Dr. Stefani due to weight loss. He did a wonderful job, my breasts are almost identical, though one aerola is a tad bit bigger than the other; and you really can't notice it unless you stare at them. But having this kind of surgery you have to expect something such as that happening. I had a month off of work due to retooling of my plant, and had no problem getting my immediate surgery squeezed into the next week. I loved all the nurses, super friendly and Stefani was laidback! Amazing!! I can't say enough great things about Dr. Stefani and his staff especially Patricia. I called with a question being 3 weeks post op and she called me right back with tons of helpful tips and definitely answered my question. I have already recommended several friends to see Dr. Stefani! Kelly had a breast reduction with Dr. Stefani. I had to have a double-mast from breast cancer. Dr. Stefani did my reconstruction & did absolutely amazing work! Cannot ever say "thank you", enough. There were spots under my eyes that were really bothering me and I had been told by another doctor that if I removed these growths that my eyes may pull down; but they would continue to get bigger. I then decided to see Dr. Stefani on the advice of a doctor who knew his work well. I am so very happy with the results. Dr. Stefani and his staff are wonderful, and I would never be afraid to go back for any further work down the road as I get older. Thank you for everything, I love my "new look. Your thoughtfulness is very much appreciated, you're my favorite doctor! Barbara had a modified rhytidectomy (facelift) and fat grafting with Dr. Stefani. I just wanted to thank you for doing such a perfect job on me. It seemed like they couldn't be fixed as good as you did. I am above and beyond happy with your work. Also very happy that you worked with my insurance company to get my operation covered. BIG THANKS! Antoinette had breast reconstruction surgery with Dr. Stefani. My experience is always very good with Joanna, Maureen, Pam, and Dr. Stefani!! I enjoy getting services done by these folks. I would strongly recommend Dr. Stefani to anyone considering plastic surgery!!! Gail had a rhytidectomy (facelift) with Dr. Stefani. I'm very satisfied with the results of my surgery and would definitely recommend Dr. Stefani to friends. Ashley had a breast augmentation with Dr. Stefani. My treatment was exceptional in the surgical department at Spa Renaissance. Everyone was so caring and understanding without judgment. Felt very professional yet friendly. All my questions were answered to my satisfaction and I felt very comfortable about the whole process. Lori had a masto-aug (breast lift and implants), tummy tuck and liposuction with Dr. Stefani. Lisa had breast reconstruction surgery after mastectomy with Dr. Stefani. She also sees Joanna in the spa! I cannot thank you enough for your kindness and genuine caring and concern. I'll always remember waking up at midnight finding you standing at my bedside, when you could have been home resting after a long day. Thank you from the bottom of my heart for getting me through a very difficult time. Jill had breast reconstruction after mastectomy with Dr. Stefani. She also sees Alex and Leah in the spa! Dr. Stefani, Patricia & Michelle -- You three were voted Andiamo's top three plastic surgeon & company! Everyone thinks all three of you did a great job with me in 3 weeks, I just wanted to say thanks myself for getting me back to work, I am still taking it easy but all-in-all you three are TOP NOTCH and three of a kind. I also want to thank Patricia for my starter kit, it makes me feel a little better about what's going on in my life right now. I can't wait for the finishing touch of Dr. Stefani and I know I am in good hands. There's a long way for me to go but we are off to a good start. Thank you team! Mary had breast reconstruction after mastectomy with Dr. Stefani. Thank you so much for taking time out of your day to explain to me about the surgery I am having done. You make me feel so comfortable You are so highly respected by your patients and office staff. Your staff is wonderful as well, very kind and professional. Thanks again Dr. Stefani, I'll be seeing you soon! Donna went through breast reconstruction after mastectomy. Excellent facility and staff, I was very pleased with my experience! Brianna had breast augmentation with Dr. Stefani. Dr. Stefani is a very talented surgeon... and easy to talk to! He also really cared about my health and well being. Katie had Liposuction with Dr. Stefani. Dr. Stefani was very great and professional! I Love going to Spa Renaissance, Dr. Stefani and his staff are greatest. I absolutely love Dr.Stefani. He did a wonderful job and i'm so happy with the results. He has a wonderful bedside manner and is easy to talk to. I have recommended him to my friends and know many more he has helped. I can't begin to explain how comfortable I feel. After several surgeries and chemo, I never thought I would feel like a whole person again. Because of Dr. Stefani and the wonderful staff I do feel whole. All breast cancer survivors should be as lucky as me and end up with Dr. Stefani "fixing" us. When I look at myself in the mirror I don't see a broken woman anymore! PRICELESS!!!! I love going to Spa Renaissance. Dr. Stefani and his staff are greatest! Having surgery with RPS was Great! I love Dr. Stefani and the girls as well. Very Professional. My Surgery went Well. Took great care of me. I will be back. Spa Products are very helpful to me. Everyone who was helping me on my appointment day was professional, answered all my questions and made me feel comfortable. I was nervous but the Spa always makes me feel special… and I always feel happy and younger when I leave! I must be one of Dr. Stefani’s oldest patients, I have known him for over 17 years! I am 50 Years Old and I finally thought implants were safe enough to do the procedure. It was the best thing I ever did for myself. No one can even tell I have implants because Dr. Stephani did such a perfect job. I recommend him all the time because he is an amazing doctor. He is very professional with his office procedures and his bedside manner. He makes you feel very at ease regarding the whole process.